A grandmother-of-six has vowed to continue fighting for a visa for her new husband, who is 45 years her junior, lives 4,000 miles away, and who she met face-to-face on their wedding day. Angela Nwachukwu, 72, married her husband CJ Nwachukwu in April 2015, just three months after he had added her on Facebook and struck up a conversation. 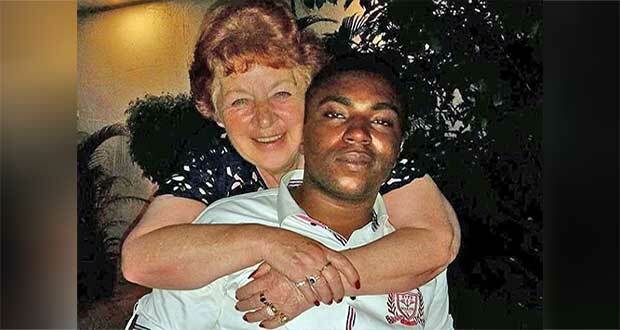 The retired taxi driver from Weymouth says she couldn't help but fall for her 27-year-old lover from Nigeria, when they started talking, and is devastated that their applications for visas have failed. She says she has spent £20,000 on him, including lawyers to help with the visas and flights to visit him, but says he had repaid her half when he can. She told the Sun she'd been left lonely and isolated after the breakdown of her marriage, six months before they met online. One day she found a message and a friend request from Mr Nwachukwu, and couldn't see the harm in striking up conversation. She said: 'He was so handsome, with big, brown eyes and a body to match. 'We chatted for hours about our families and hobbies. It was like we’d known each other for years. Before I knew it, we were messaging daily. To her surprise, he popped the question on Skype, and she gleefully accepted. The pair wed in Lagos, Nigeria, and have since seen each other twice, as she has flown there to visit him. Mr Nwachukwu has even been denied a tourist visa to see his wife, and their applications have been turned down because it's thought they won't have financial backing. Despite criticisms, Mrs Nwachukwu insists the marriage is not a scam, because she doesn't have any money and was upfront about that at the start. She now hopes he will be able to get a student visa for a Masters, to be reunited with her. British citizens can apply for a Family visa to move their partners to the UK. It's an expensive process - the Home Office charges £1,464 for people applying from outside the UK to joining their partners or spouses, and nearly £1,000 for extensions. Those willing to part with a few hundred pounds more can get the premium extension service. Spouses applying to move to be with their partners have to prove they can support themselves and their partners, and they have to have been living with them for two years. Partners will then be given permission to move for around two and a half years and should extend this after that time. Mr Nwachukwu has to be able to show he can support himself or be supported to be granted a Marriage Visitor visa, by the rules of the Home Office. Under the visa for visitors, the trip must be no longer than six months, and applicants should prove they will leave at the end. Two years ago, Julie Dag from Bournemouth told of how she was duped into spending £20,000 after falling for local musician Lamin Sidibeh while on holiday in The Gambia in West Africa in 2007. Appearing on a Channel 5 documentary, she revealed that she had married him, before spending her honeymoon filling in visa applications. But within three months of returning to England and setting up home, he had left her.